Lobster is one of the many things Maine is known for. Yesterday, I enjoyed a lobster roll at Eat Up New England favorite Robert's Maine Grille in Kittery, Maine. They'll prepare your roll warm with butter or cold with mayo. I went for warm. There really is such a difference in taste when you have lobster right by the ocean. 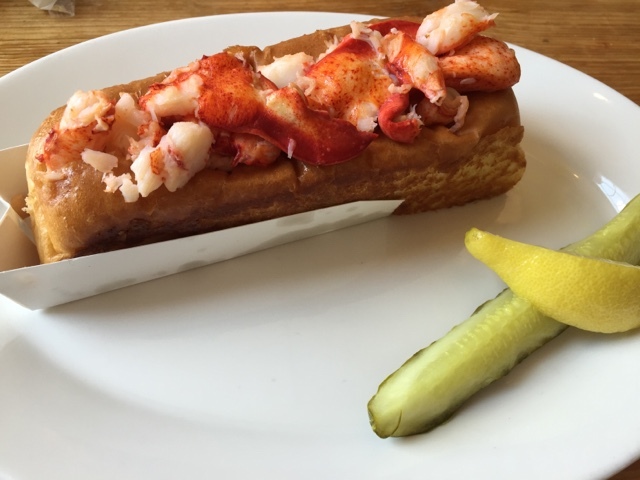 Robert's lobster rolls come in regular and jumbo sizes. The one above is regular and was plenty, especially since a paired it up with some clam chowder. Their regular lobster and chowder special is $25. The jumbo special is $30. Robert's really is the place to go for lobster. There's a tank full of live lobsters on the left when you walk in. They'll steam one up or top off a cobb salad with lobster meat. Customers can even order a clambake for two which comes with a lobster. Robert's is open year round, so you can enjoy a lobster even in the middle of the winter!